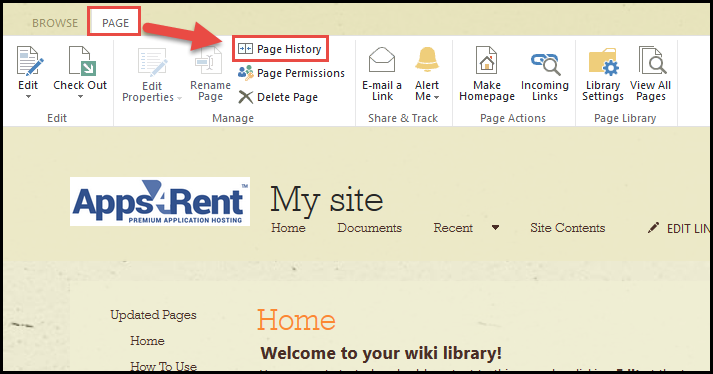 The Wiki pages in a SharePoint are stored in site pages library; they can easily be versioned and the different versions get displayed in the history of changes made to any particular page. Wiki pages are intuitive in terms of both making changes to content and restoring earlier versions. 1) Go to your SharePoint Wiki page. 2) Go to the Page History option under the Page tab in the ribbon. 3) Click on Version History. 4) And you will get to see the different versions of the Wiki page that you created.